UPDATE MAY 2017: 888poker brings the successful Blast format to a new level. As the poker room announced on May 30th 2017, the Jackpot Sit & Go games are now available in an eVen quicker variant: The 2:00 Fast Blast. The Fast Blast Games are already live at 888 poker and in the app. But don’t worry: In case the two minute timer is too hectic for you, you can still play the old version which we reviewed last year. Since May 2017 888poker offers the quicker Fast Blast games with a 2 minute timer. We already played the 2:00 Sit and Gos. THe first impression: Luck is eve more important here than in the original jackpot games. You may have only 3-4 hands until the timer hits zero and everyone goes All-in until we have a winner. This can be a lot of fun – but also quite frustrating for experienced players. We suggest you check it out by yourseves. Simply download the poker client here and start playing. What prizes can I win at 888poker Blast? 888poker and the 888 poker App have just received another exciting feature: Already offering classic poker and the fast-fold variant “Snap” the 888poker software has just been expanded by adding “Blast” poker to its range in July 2016. Blast is a super fast Sit & Go with four players where the prize is determined randomly before the game starts. Thus, also the world’s second biggest poker room is now offering its own jackpot Sit & Go game. In contrast to forerunners like Spin & Go (PokerStars) or Twister (iPoker) Blast comes with a special feature – a timer that starts an automatic all-in. In this article we give you an introduction to the rules and have a look at the advantages and disadvantages of 888’s Blast Poker. Blast is a Jackpot Sit & Go where the prize pool is determined randomly. You can win up to the 10.000 fold of your bet. At best you can play for a total of $300.000 dollars within one round of Blast Poker. That would be the case, if the jackpot was hit in a $30 buy-in game (which is the highest limit). $30 x 10.000 makes 300.000 US dollars. However, it is much more probable that you only play for double the amount of your bet. Thus, since every game of 888 Blast is played with four players, oftentimes only half of the pot is distributed. The rest – minus the main prize – is basically “saved” and distributed in the higher levels. On the lowest level (double the bet) the winner of one round of Blast Poker receives the entire prize. Starting at the 5-fold of your bet, also the second place wins a prize. The higher the overall prize, the more money is distributed among the players. 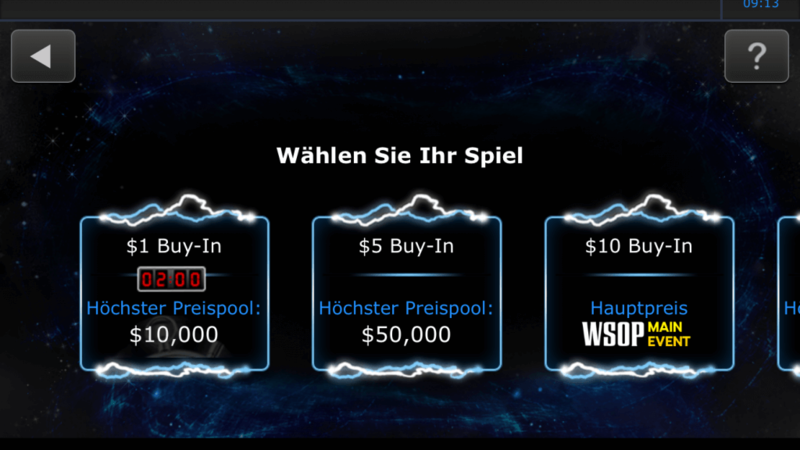 This way, when playing for a prize pool of 1.000 or 10.000, even the last place receives 10%. See further below for our exemplary lists of the detailed rules of 888poker Blast. Where can I play Blast Poker? 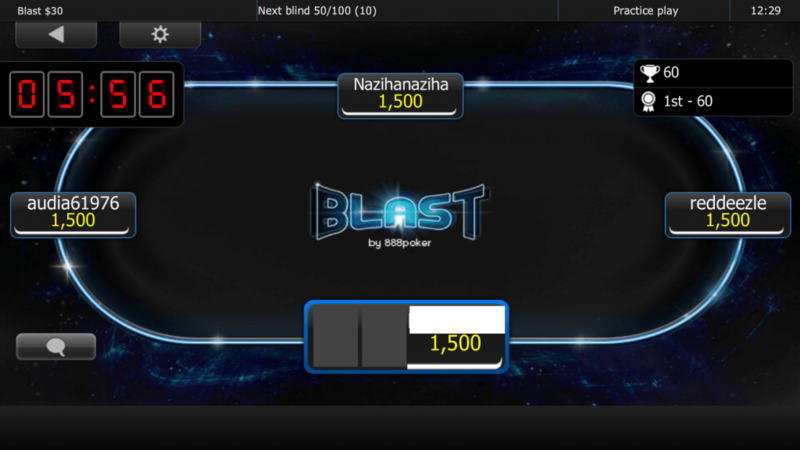 888poker has been offering Blast on all platforms – except for the web app – right from the beginning. Thus, you can play Blast on your PC or Mac, Android, iPhone or iPad. All you have to do is download the 888poker software or 888poker App. The following links start the download process directly, your device is identified automatically. Since Blast is also available as a play money version, you can give it a try without committing to any obligations. Obviously, this also applies to the 888poker App, where Blast has been added as a third category next to Snap and classic poker. Our recommendation: If you haven’t already got an account at 888poker, you can play real money Blast for free. In order to do so, register as a new player after the download and you’ll receive the free $88 welcome package. For more information see our promotion website: 888poker bonus. What are the differences between Blast and other jackpot poker games? There are a number of details that differentiate Blast Poker from similar offers of 888’s competitors. For example there is a significantly higher stack of 1500 chips at the beginning of each game. Or the fact that there are four players instead of three. However, the main difference is the timer, which is located in the upper left corner of the gaming table. It starts with at least 6 minutes (the higher the prize, the longer the timer runs). When the time has expired, all players go all-in automatically until the winner is determined. The Blast timer is located in the upper left corner of the app. This way, 888poker takes a more direct and consequent path towards gambling than PokerStars, Partypoker or the iPoker poker rooms have been doing so far. Next to the random winning amount, at one point chance also decides – at least to some extent – who wins the game and takes home the money. This doesn’t mean that every round of 888poker Blast has to end with an all-in. Many games are probably settled before it comes to that. And good poker players at least have the chance to achieve a good starting basis for the finale before the “Blast” hits. Nevertheless, Blast is much more influenced by chance than other comparable jackpot Sit & Go games. Not all experienced poker players might like this. But the timer could actually be an enrichment when used as a tactical variant. On top of that, it’s also an advantage to know how long the game will take before it has even started. You might only have 15 minutes during your lunch break, which is sometimes not enough at other Sit ‘n Gos. At 888poker Blast however, you’ll definitely have enough time, since all players go all-in after 12 minutes at the latest. Let’s now have a look at the limits, rules and payouts. 888poker Blast is available on four different levels: $30, $5, $1, and 10 cents. Frequencies vary a little depending on the level. Here are some exemplary excerpts. Of course you can have a look at your game of choice’s details at the lobby of the 888poker App or the desktop software. No matter what pot size the random generator determines – the number of chips at the beginning is always 1500. 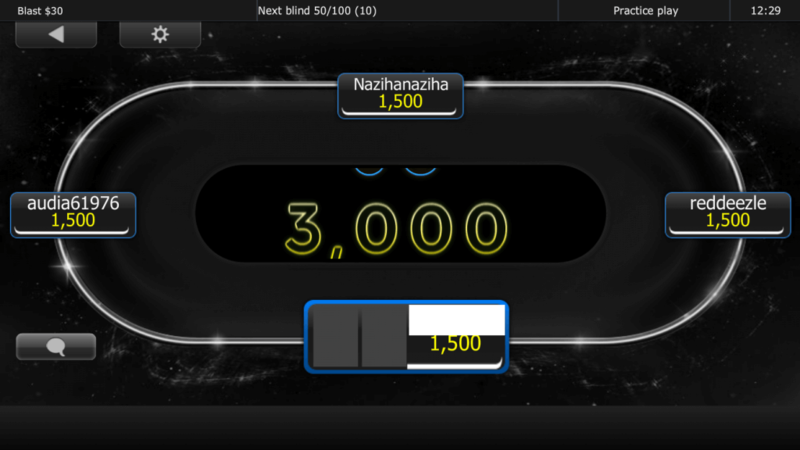 With the highest multiplier there are six blind levels before the timer runs out after 12 minutes and all players go all-in. With the lower multipliers one or more levels are skipped. At the earliest, the game is over after 6 minutes (2-fold and 5-fold). The following table shows how the randomly chosen prize pool is distributed. The higher the winning multiplier, the lower the share of winner of the first prize.